Swift 3D PS is a fun and easy-to-use Photoshop plug-in that will have you exploring entirely new hemispheres of Photoshop CS4 Extended. 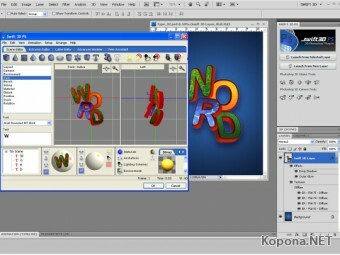 It accomplishes simple 3D tasks in seconds with remarkable results and places your 3D text, extrusions or models back into Photoshop as 3D layers. These layers remain fully editable by Swift 3D PS, even after Photoshop's array of layer styles and filters are applied. Swift 3D PS offers the same powerful capabilities of our standalone product, but works within the confines of the Photoshop environment.